Have you heard about a deity called Bullet Baba? Amongst the endless list of Gods and Goddesses we have, here's a Royal Enfield bullet that has managed to get worshipped! Believe it or not, there are several such strange and mysterious temples in India. The age-old religion of Hinduism has rewarded to its devotees some of the best temples since ancient times. The Kings who ruled each dynasty took pride in building the best temple to boast of. We have many temples in India that are more than 2000 years old and all of them are unique in their own ways. Apart from these legendary temples that boast of the strong religious faith of India, we also have temples like those that worships deities as weird as bikes! Let's take a look at some of the most mysterious temples in India. Close to the Scindia Ghat in Varanasi, there is a temple that leans like the tower of Pisa, grabbing all the attention. 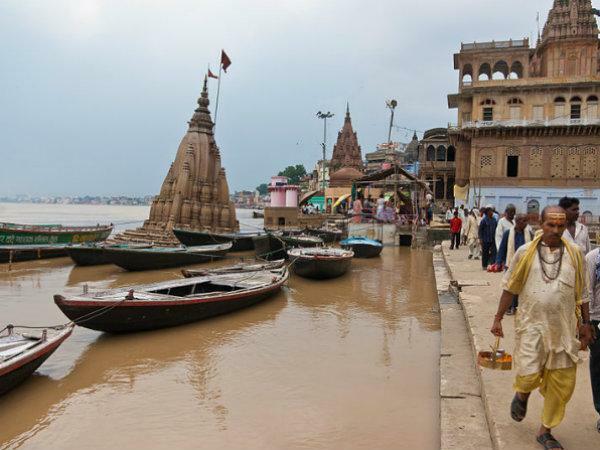 This temple has actually submerged into the river due to the contruction of the Ghat which was back in 1830. Today, this Shiva temple is abandoned and closed. 2. The Only Brahma Temple in the World! Now this is interesting. The only Brahma temple in the world is in Pushkar. The temple was built in 14th century and has a huge idol of four-headed Lord Brahma. Here's the interesting legend behind the construction of this temple. 3. A Chinese Kali Temple?? In Kolkata, there is a small town called Chinatown in Tangra which got its name as the residents of the area are mostly Chinese. The ethnic Chinese here visit the temple and offer prasad like noodles, chopsuey, etc. Most of the Chinese who live here are devotees of Goddess Kali, or to be precise, of the temple. Can you imagine a temple could disappear and then be back to sight after a while? Yes, around 40 miles from Vadodara, there is a Stambeshwar Mahadev Temple. The temple that stands in the Arabian Sea, can be seen only during hours of low tide, which means that the temple is submerged in the sea during high tides. The Bullet baba or the Om Banna shrine is situated close to Jodhpur in Rajasthan. Devotees worship a Royal Enfield bullet here and the deity is also offered liquor. The residents of the village believe that the deity saves them from road accidents and other peril while travelling. 6. Rats Are Worshipped Here! Karni Mata Temple in Deshnok, which is 30 km south of Bikaner in Rajasthan, worships rats as it is believed that the rats are the incarnations of the Goddess Karni Mata (who is an incarnation of Maa Durga) and her four children. Rats are allowed to freely roam in the temple premises and also fed with milk and other prasad. The Hadimba temple in Manali is a four-storeyed temple that has the unique pagoda style architecture that makes it distinct from other temples. The temple is dedicated to Devi Hadimba, the sister of demon Hadimb. The Goddess is also the patron deity of the Kullu kings.